Is there any usual/best practice to fetch historical fomc meetings events online? We document large average excess returns on U.S. equities in anticipation of monetary policy decisions made at scheduled meetings of the Federal Open Market Committee (FOMC) in the past few decades. These pre-FOMC returns have increased over time and account for sizable fractions of total annual realized stock returns. While other major international equity indices experienced similar pre-FOMC returns, we find no such effect in U.S. Treasury securities and money market futures. Other major U.S. macroeconomic news announcements also do not give rise to pre-announcement excess equity returns. 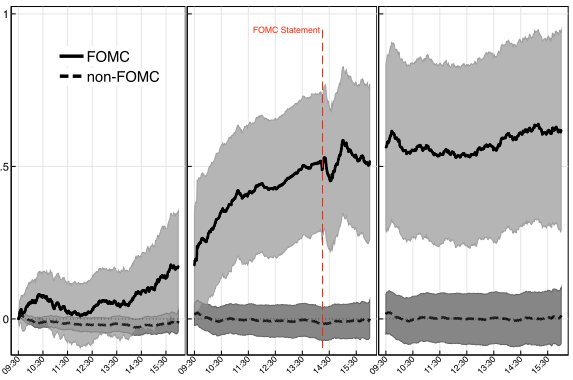 Pre-FOMC returns are higher in periods when the slope of the Treasury yield curve is low, implied equity market volatility is high, and when past pre-FOMC returns have been high. We discuss challenges at explaining these returns with standard asset pricing theory. The Fed website has all this information. The period 2010 to 2016 is very conveniently laid out here http://www.federalreserve.gov/monetarypolicy/fomccalendars.htm [as already noted by vonjd], and meetings from earlier years can be looked up more laboriously here http://www.federalreserve.gov/monetarypolicy/fomc_historical.htm . I made my own spreadsheet and I just update it once a year when the Fed posts new information. Not the answer you're looking for? Browse other questions tagged data fomc or ask your own question.